Something completely unrelated to security but i just had to share. I have been looking for a good, simple, clean RSS notifier for Mac since Apple stripped it from Mail and i have found one. The reason i am sharing is because it is a great way to stay up to date on this website and many more. Any site that offers an RSS feed (like this one) can be loaded into this app and it will notify you in a non-intrusive, simple way. 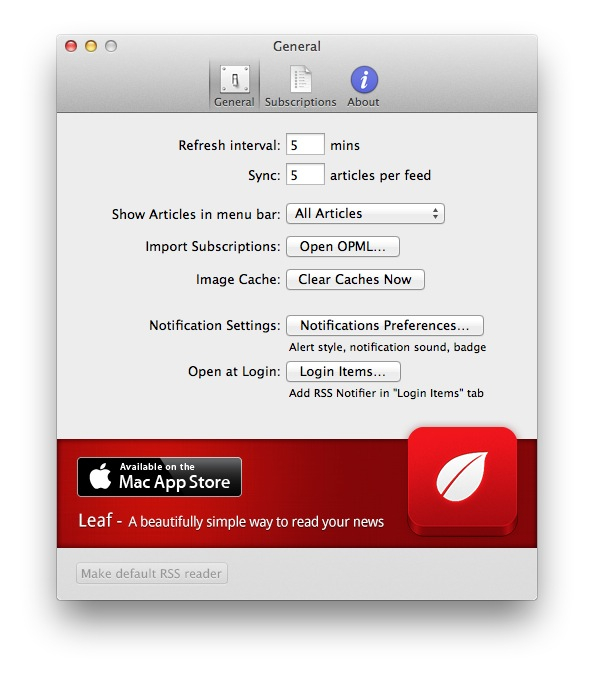 The app is called ‘RSS Notifier’ and can be found in the Mac App Store for free. The app sits in your menu bar and checks every few minutes for updates. One simple click and the article will open in your browser (or an RSS Reader, if you have one installed). I have all my RSS feeds back and get notified in a very pleasant way when new articles are out 🙂 What better way for you to get the latest Security Spread within minutes after it’s published! Just click the ‘Entries RSS’ link in the ‘META’ panel on the right and RSS Notifier will do the rest. Unread articles will show in solid text, read articles show grey. You can also create folders to sort the feeds and avoid clutter. The preferences are simple but offer you everything you need. Don’t forget to add RSS Notifier to your login items. I mean would the app collect information and if so, what kind of information and how will the information be handled/managed?